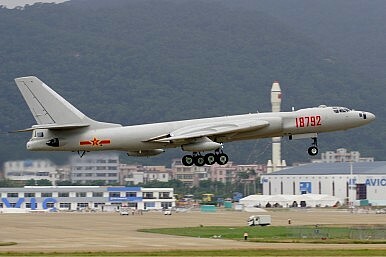 Beijing’s bomber fleet is able to strike distant targets with precision ammunition, according to Chinese media. The People’s Liberation Army Air Force (PLAAF) has extended its all-weather, long-range precision strike capabilities, according to a PLAAF aviation expert quoted in China Daily. “The fact that our H-6K bombers have performed several long-distance drills far into the Pacific Ocean indicates that the H-6K fleet has become capable of conducting various operations such as long-range precision strikes,” Fu Qianshao, a PLAAF aviation equipment expert, told the state-run newspaper. The H-6K is a derivative of the Soviet-era Tupolov Tu-16 twin-engined jet strategic bomber. However, the latest Chinese version of the bomber, first flown in 2007, has undergone major upgrades including new fuel efficient D-30-KP2 turbofans, lighter weight composites, and modern electronics. Without refueling, the maximum range of the H-6K bomber is 1,900 miles; however, it can be extended to 3,100 miles with two mid-air refuels, according to War is Boring, while carrying a payload of up to 12 tons. There are currently around 36 H-6K strategic bombers in service with the PLAAF. “In the past, our bombers could only deliver airdropped bombs and so were unable to conduct precision attacks, but the H-6K, with the adoption of some of our most advanced aeronautic technologies, is able to carry and launch air-to-surface cruise missiles and anti-ship missiles, which means it can take out multiple targets on the ground or at sea within one mission,” Fu stated. The H-6K, which lacks stealth capacity, can carry up to seven YJ-12 supersonic anti-ship missiles (six on wing pylons plus one in the bomb bay) or CJ-20 subsonic land-attack cruise missiles with an estimated range of 250 and 1,500 miles respectively. “It can also carry a wide range of new precision-guided munitions available from four Chinese weapon manufacturers,” according to IHS Jane’s Defense Weekly. “The PLA has defined its air force as a strategic force and pledged to obtain offensive capability for it. An air force with strategic aspirations must be able to perform long-range precision strike operations, so the H-6K is undoubtedly a valuable asset to the PLA Air Force,” Fu added. Fu, furthermore pointed out that during recent military exercises the H-6K overcame “enemy defense” and “the enemy’s electromagnetic blockage.” The principal weakness, according to some military analysts, remains the targeting system of the H-6K, as well as the PLAAF’s overall targeting acquisition network. While sporting a modern air-to-ground radar in the its large solid nose as well as a new electro-optical targeting pod, it remains unclear whether the H-6K (or the PLAAF as a whole) has the ability to collect accurate targeting information and process it quickly enough for bombing raids far away from the Chinese coast. The head of the PLA Air Force recently confirmed Chinese intentions to design and produce a new long-range bomber.